Open a book and you open the door to a new world. The Library of Congress welcomes children, teens and adults to the Young Readers Center, a place especially designed for young people. 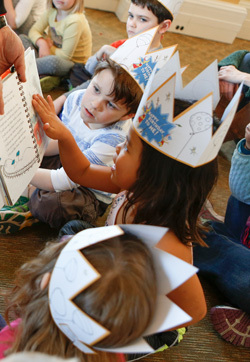 The Young Readers Center (Jefferson Building, Room G29) will continue to offer Story Time for infants and toddlers every Friday (except holidays) starting at 10:30 a.m. NOTE: Due to an occupancy review of the Center by the Library of Congress Safety Services Office, we are required to limit the number of participating children and adults to 50. 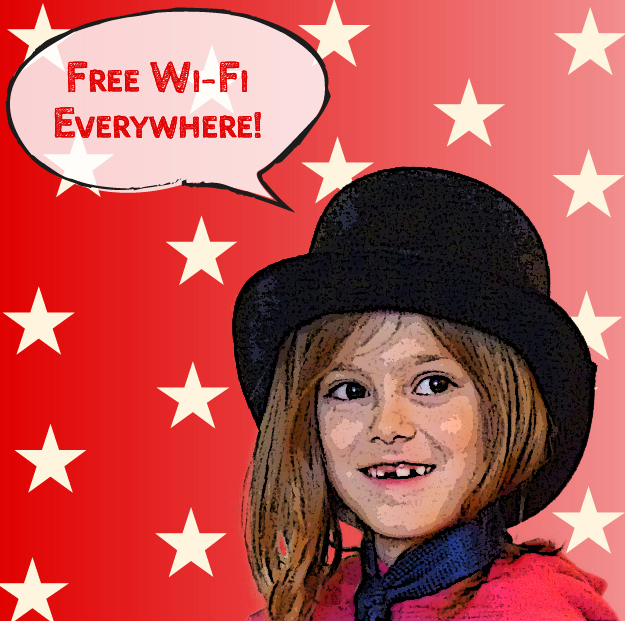 Free admission stickers will be distributed on a first-come, first- served basis beginning at 10 a.m. Thank you for understanding and we look forward to your participation. Please check this website or call the YRC at 202-707-1950 for any changes to this schedule. Five local schools are participating in this year’s program: Richard Wright Public Charter School for Journalism and Media Arts, Stuart Hobson Middle School, Dunbar High School, Roosevelt High School and Eastern High School. Teen Board members act as ambassadors from their schools and respective communities to the Library, and also help connect the Library of their schools and larger education community. They learn first-hand about the resources and departments of the Library of Congress, and in turn advise the Library on teen related issues including social media and how to heighten the awareness of Library resources and opportunities for teens. Our focus this month was on the Veterans History Project (VHP). Andrew Huber, Liaison Specialist for this project, was our guest presenter. From Mr. Huber, we learned the scope of the VHP, which focuses on the personal accounts of veterans who served in the military from World War I to the present. The project collects personal narratives from veterans, including correspondence, audio and video taped interviews of soldiers, written accounts and photographs. Mr. Huber’s remarks served as background for the teens learning how to actually conduct an interview with a veteran. We were honored to have such a veteran in our midst. Chester Fagan, who is a teacher and advisor at the Richard Wright Public Charter School, and who chaperones students from his school to Teen Board, served in Vietnam, in the U.S. Navy as a Petty Officer. Mr. Huber conducted a live interview of Mr. Fagan, with the teens as active participants in this project. The teens learned a new dimension of Mr. Fagan, his life in the service, and what brought him to teaching, plus how to respectfully conduct an interview for this project. It was a pleasure to have Mr. Huber present to the Teen Board, and of course a delight to recognize Mr. Fagan’s service to our country. Author and illustrator Jarrett J. Krosoczka joined us for a heartfelt presentation on his new book, Hey Kiddo. Many of the students were familiar with his most popular Lunch Ladies series, which was of course full of laughter and adventure. Jarrett’s discussion of Hey Kiddo: How I Lost My Mother, Found My Father, and Dealt with Family Addiction, was from his heart and personal life story. He had the students with him on this journey of his life as a child and teen, growing up under difficult circumstances. Many questions from the teens, and then they all received copies of the book, which Jarrett signed for each student. It’s not every day that teens receive a chance to meet in person with such a talented author and illustrator, and we appreciate the fact that Jarrett took time out of a busy book tour to meet with us. This was our first meeting of the school year, so we took some time to get to know each other, and learn more about the program. We talked new books, and everyone helped themselves to some new titles for leisure reading. We then headed off to explore the Thomas Jefferson Building of the Library of Congress. The Great Hall, with light fixtures featuring bare light bulbs as a tribute of Benjamin Franklin and his discovery of electricity, plus a beautiful mosaic of Minerva, the Roman goddess of learning and wisdom were two favorite stops. The teens enjoyed looking at the list of famous authors and accompanying quotes, but they had some suggestions for updating the list! After a peek at the magnificently restored Main Reading Room, we headed to the Thomas Jefferson Library, which re-creates the initial 6,487 volumes from his personal library that started the Library of Congress. We were running out of time, but headed for a quick stop at Baseball Americana, which will be on display through next June. So much more to explore, but our year is just beginning. 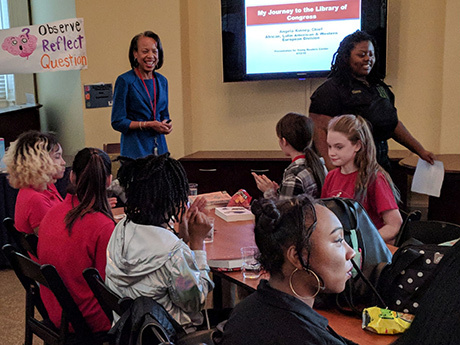 After a brief discussion of some new, and soon to be published teen books, we welcomed our guest speaker, Ms. Angela Kinney, Chief of African, Latin American and Western Europe Division (ALAWED) in the Library of Congress Acquisitions & Bibliographic Access Directorate. Her division works to purchase and catalog print (including newspapers and periodicals) and non-print current and historic materials from vendors in the areas covered by her division. In addition to a most interesting description of her job and the duties entailed, Ms. Kinney gave the students an amazing window into the process of career selection and advancement. Students were given a breakdown of the federal pay structure, and ways that a federal employee can advance within this structure. She was proud to tell the students that her start with the LOC was a part-time position in the gift shop, but with additional education and even a term with the LOC Leadership Development Program, she now heads this most important division. A bonus is that she travels to amazing places as part of her job responsibilities. Teens were most interested in all parts of her presentation, and enjoyed speculating (with her encouragement) about where each of them would be in 20 years, career wise. A wonderful meeting for the teens and accompanying faculty members. Winners of the 2018 Walter Awards from We Need Diverse Books join National Youth Poet Laureate Amanda Gorman in the Library of Congress Young Readers Center. From left to right: Jason Reynolds, Carol Boston Weatherford, Amanda Gorman, Francisco X. Stork, Jeffery Weatherford. The Teen Board welcomed the National Youth Poet Laureate, Amanda Gorman, to the Board meeting. Ms. Gorman took time out from her busy schedule as a Harvard University sophomore to talk about poetry, read some of her poems, and answer questions from students on the Board. Ms. Gorman, who needed no backup with her amazing talents and energy, was joined by authors visiting the Library of Congress for the We Need Diverse Books Walter Awards ceremony that would be held the following day. 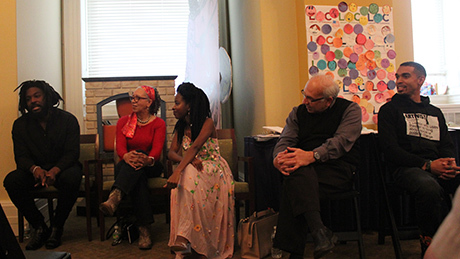 Authors Mitali Perkins, Jason Reynolds, Francisco X. Stork, Carole Boston Weatherford, and Jeffery Weatherford joined Amanda to answer questions and give their perspective on writing, poetry and other topics. There was a lot of energy and excitement at the meeting, with so many talented and well-recognized guests in the room. This month, our focus was on books, new and old. Teens discussed the ones they loved, and had fun too with those books that they really did not enjoy reading. Hunger Games and Harry Potter were two titles that sparked some strong discussions, some positive about the books and some a little negative. Kindred: A Graphic Novel Adaptation by Damian Duffy opened up a Teen Board member to the wonderful science fiction writings of Octavia Butler. This also results in a shout out for all things graphic novel format. Teens took home some 2018 titles to read and review. Like Vanessa by Tami Charles was one of those titles. Look on our website for a review coming soon. After some time for small group book discussions, and news of the literary activities of some of the schools, our guest speaker was Barbara Natanson from the Prints and Photography Division. Did you know that this Division contains over 15 million images? Starting with some amazing Civil War images (no photoshopping back then) we moved to architectural drawings including one image of a proposal for the Thomas Jefferson Building. Posters and cartoons are an important part of this collection. To view online images from the Library of Congress, start here. Our first meeting with introductions and welcomes. New books, talks about favorite books and then on to our guest speaker: Rene Sayles from the Library of Congress Geography and Map Division. We learned that this Division contains over 5 million maps and 72,000 atlases. Students were shown pictures of some famous maps (including maps used by Christopher Columbus) and even relief maps made of a variety of substances including chocolate. We are proud to report that no nibbles were taken. Should you want to look further at the Library’s map collections, start searching here. by Chelsea Sedoti. Sourcebooks, 2018. Reviewed by Charlotte, Stuart-Hobson MS. 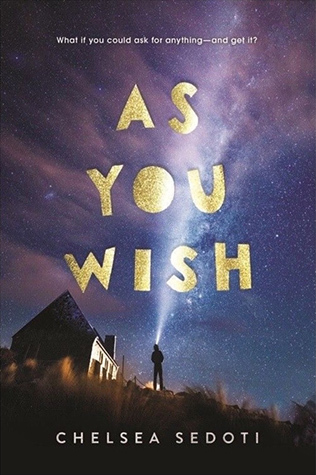 In the small town of Madison Nevada, teens turning 18 have one wish. Some wish for popularity, money, physical enhancements and maybe love. Eldon is turning 18 soon, and has lots to consider before choosing his wish, or maybe not wishing at all. by Hanna Nowinshi. SwoonReads, 2017. 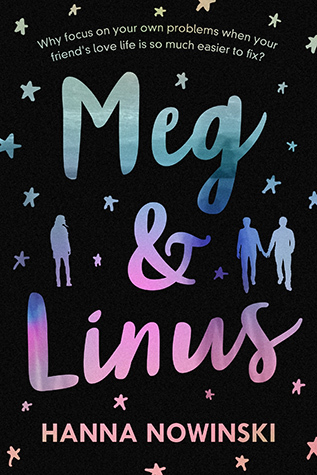 Reviewed by Madeline, Stuart-Hobson MS.
Best friends, Meg and Linus share their enthusiasm for being gay, loving school, good coffee and of course, their friendship. 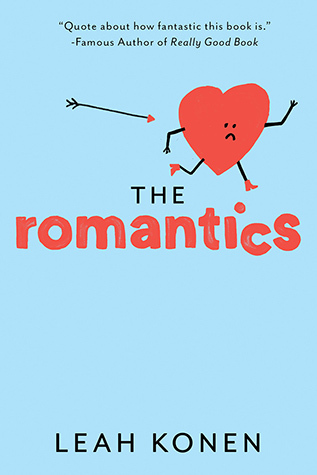 They share and interfere in the ups and downs of each others’ high school romance. by Leah Konen. Abrams, 2016. Reviewed by Ineisha, Richard Wright PCS. “Love” is the narrator and unofficial manipulator in this story of romance. The statement from Love, “humans make a lot of mistakes, I don’t” gives you an idea of where the story is going. 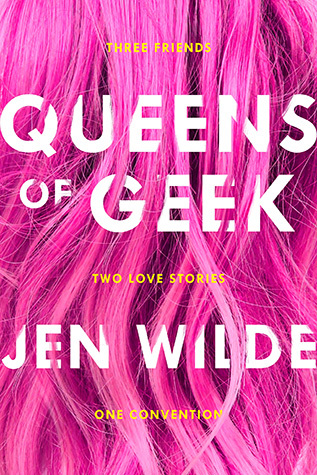 by Jen Wilde. Swoon Reads, 2017. Reviewed by Jacqueline, Richard Wright PCS. Two teens on an adventure to the US from Australia. The book is told from each teen’s perspective as their travels continue. 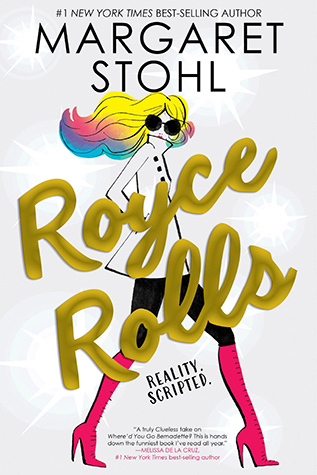 by Margaret Stohl. Freeform/Disney 2017. Reviewed by Maddie, Stuart Hobson Middle School. Bent has been a TV start since she was 12, and plays a teen who loves trouble. 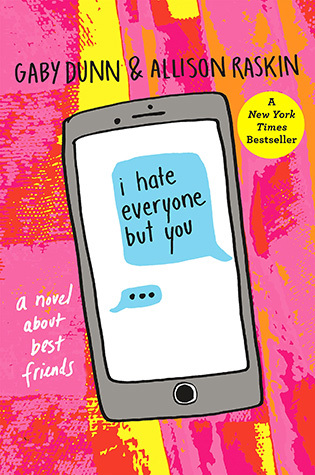 In this hilarious depiction of life as a star, she finds another way to look at her world through friendships. by Gaby Dunn and Allison Raskin. Wednesday Books, 2017. Reviewed by Latia, Richard Wright PCS. Written in the form of emails, two best friends from high school share their college adventures with each other. by Cindy Pon. Simon and Schuster, 2017. Reviewed by Remi, Richard Wright PCS. A dystopian novel, with two clear groups. One lives in a polluted city with plagues and other problems. The other group in a much better world/lifestyle. 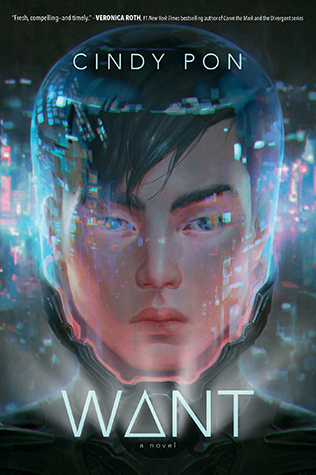 Two teens from these separate worlds meet up to problem solve, hoping for a better world.